How do sales performance and social media campaigns influence each other? Most companies don’t know because this data is siloed in different departments. While plenty of startups try to make sense of enterprise “big data” — enormous primary data sets like Facebook’s archive of posts or Netflix’s recommendation insights, a startup called Argo wants to help companies understand and collaborate around “small data” stuck in different departments on the edges of their business. 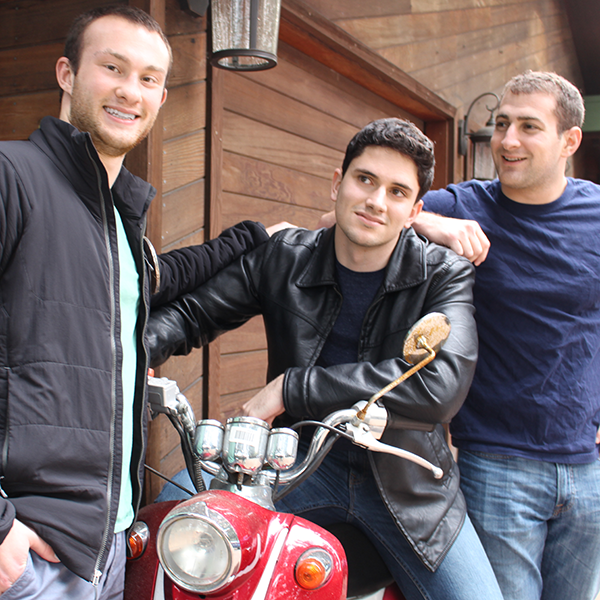 Formerly known as Arktos, several Stanford dropouts were building a better Excel spreadsheet. But now they’ve renamed themselves Argo, raised a $1.525 million seed round led by Accel Partners, and pivoted to build “a data exploration tool that connects people across departments to help them collaborate”, says 21-year old co-founder Ari Dyckovsky. That wasn’t the plan at first, though. Flash back to 2013, when Dyckovsky was just your regular freshman at Stanford who’d grown restless studying quantum physics and quantatative finance. You know, typical teenager. He became fast friends with fellow freshman and web developer Ryan Atallah. With Instagram’s sale still fresh and Snapchat on its meteoric rise, both founded by Stanford students, the two inevitably began dreaming up startup ideas. “We liked making complex things simple, and allowing people to learn things. We wanted to make data more accessible to people, and more importantly make the knowledge you get from data more accessible” Dyckovsky recalls. The idea that emerged was an alternative to Excel. “Instead of just being rows and columns, why don’t we make an interface that makes it easier to build visualizations?” the pair thought. So Dyckovsky looped in his investment banker cousin Andrew Vigneault who was a few years older, and they began cranking on what would be come Arktos. “It came to the point where was all we could do was think about the company. We didn’t focus on school or our jobs” Dyckovsky remembers. So he and Ryan dropped out of Stanford, and Vigneault quit his job. Thanks to strong computer science backgrounds and fitting the mold of the ambitious, white Ivy League dropouts, they were able to raise the start of a $1.525 million seed round from early Facebook investor Accel Partners. Even if the product wasn’t fully baked, Accel partner Ping Li banked on the tight-knit team. But soon, the idea of building a prettier spreadsheet lost its luster, but they were still fascinated by making knowledge from data more accessible. So over the Summer of 2014, Arktos morphed into Argo, still run by Dyckovsky (21), Atallah (20), and Vigneault (25). They crew their round by pulling in angels Steve Loughlin (RelateIQ), Kevin Mahaffey (Lookout), Adam Ross (Goldcrest Investments), Chuck Moran (Skillsoft), Kathy Olsen (Eminence Capital), Ryan Simonetti (Convene), and Brad Katsuyama (IEX). The money allowed them to grow the team to 12 with several engineers and a designer, and get serious about Argo. Typically, if a company wanted to better understand how disparate small data sets influenced each other, they’d either have to hire expensive data scientists to aggregate the information and build clunky internal tools, or pay for pricy third-party ones like Palantir. Dyckovsky wants to make it easy and affordable to do the same thing. “We’re building a solution that doesn’t require experts to understand your data” he says. Without code or complicated commands, Argo will let non-technical team members compare data sets, create visualizations, and draw actionable conclusions. If that sounds a bit vague still, Dyckovsky apologizes for me. He declares, “We’re not at the stage where we’re launching or letting the public see what we’re launching”. But after a summer hacking in an apartment together (and hacking an apartment together — they built their own beds and desks to save money), Argo is ready to move into the alpha testing phase and sniff out its first customers. Still, it’s companies that embrace the raw power of data that could be Argo’s biggest threat. If more established players try to dive down into small data, Argo could be outgunned by more comprehensive products that weave all of a company’s information together. But Argo is relying on the nimbleness of its small team to outmaneuver the slower giants. “We grew up on the cloud. We grew up with all this technology, and with this concept of not just making technology powerful, but pretty and natural and inline with what users want to experience” Dyckovsky states.